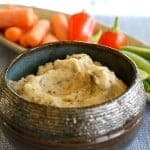 White Bean Dip is a quick and easy protein- and fiber-packed friend to dip fresh vegetables and whole-grain crackers! Canned beans make it super simple! In a food processor, combine all ingredients. Process until smooth, or to your desired consistency.